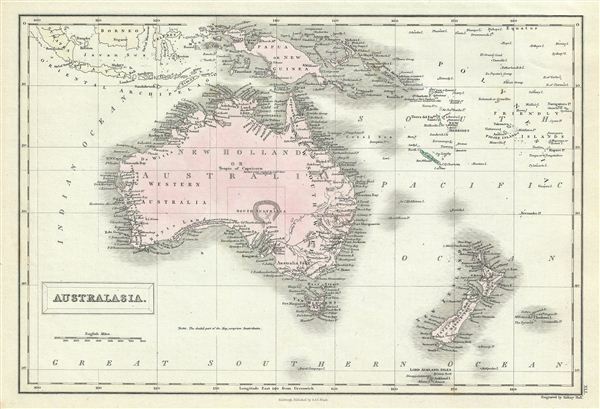 This is a fine example of Adam and Charles Black's 1851 map of Australia and New Zealand. The map covers from the east Indies to the Auckland Islands and the Chatam Islands of New Zealand. It includes New Holland or Australia, New Zealand, Tasmania (then known as Van Diemen's Island), Papua New Guinea and Melanesia. An interesting map issued just as most of the earth's non-polar shore has been explored. Gone are many of the errors of the previous century with the coastlines accurately rendered. Inland though, much remained confused. Vast stretches of unmapped territory and speculative cartography fill central Australia, New Zealand and Papua New Guinea. In 1840, after the signing of the Treaty of Waitangi, the British annexed New Zealand as part of the Australian colony of New South Wales. However, it separated from New South Wales to become a colony in its own right in 1841. Victoria, which became an independent colony separate from New South Wales only in July 1851, is here depicted as part of New South Wales and is identified as 'Australia Felix' (the early name given to the lush green pastures of western Victoria). Various cities, towns, rivers, mountains, islands and several other topographical details are noted with relief shown in hachures. This map was engraved by Sidney Hall and issued as plate no. XLI in the 1851 edition of Black's General Atlas of the World.